The Waikato Rugby Union (WRU) is the official governing body of rugby union in the Waikato area in the North Island of New Zealand. Its senior representative team competes in the ITM Cup (formerly known as the Air New Zealand Cup), and won the inaugural Air New Zealand Cup in 2006. Waikato Rugby Union was founded in 1921. The senior representative team plays its home fixtures at the Waikato Stadium in Hamilton. The union's colours are red, yellow and black. Waikato are the current holders of the Ranfurly Shield. Waikato Rugby Union was founded in 1921. The inaugural representative match played ended in a 15-all draw against Taranaki. Waikato had its first win by their third fixture when they defeated Manawatu 6–0. The first home match was played against New South Wales from Australia at the Claudelands Showground, losing 11 to 28. In 1925 the Rugby Park was opened, and in 1928 Waikato adopted their now famous colours of red, yellow and black. In 1932 Waikato challenged Canterbury for the Ranfurly Shield. The challenge was unsuccessful. Waikato made another unsuccessful challenge for the shield in 1949 against Otago. In 1951 Waikato successfully challenged for the Ranfurly Shield, defeating North Auckland 6 points to 3. They defeated Auckland the following season, also 6–3 to win back the shield. In 1966 Waikato defeated Auckland again to regain the Ranfurly Shield. In 1980 Waikato won the Ranfurly Shield for the first time since 1966, defeating Auckland 7 points to 3. In 1954 Waikato had 11 wins and one draw from 14 matches and were tabbed the champions. The draw was in a remarkable Ranfurly Shield challenge where they drew 14 all. The country had never seen anything like this before, Christchurch was invaded by thousands of Mooloo supporters who were led by the president at the time, Horace 'Cal' Calcott. The Mooloo express captured the imagination of fans nationwide. These images were vividly remembered by many who attended. Waikato became the first Union to win the National Provincial Championship (NPC) when the format included semi-final and finals structure for the 1992 season. Waikato defeated Otago 40 to 5 in the final. 1993 was also very successful for Waikato; winning back the Ranfurly Shield with a 17 to 6 victory over Auckland, and making it to the semi-finals of the NPC, only to be defeated by Otago. Waikato defeated Taranaki 40 to 19 for a successful challenge for the Ranfurly Shield in 1996, and defeated Auckland 31 to 29 for the shield in 1997. That season they also made it to the semi-finals of the NPC, but were defeated by Counties Manukau 40 to 43. In 1998 they made it to the final of the NPC, in what was a rematch of the 1992 final, against Otago. Waikato lost the match 20 to 49. They made it to the semi-finals the next season, but were defeated by Wellington 17 to 38. In 2002 Waikato made it to their first NPC final since the 1998 loss to Otago. Though they were defeated by Auckland, 28 to 40. They made it as far as the semi-finals in both the 2003 and the 2004 seasons, and were defeated by Wellington 29–30 and 16–28 respectively. Under the new Air New Zealand Cup format, Waikato became the first side to win the competition, defeating Wellington 37–31 in the final. It was the first time in fourteen years that Waikato had won the national provincial competition. In 2007 Waikato began with wins over Manawatu, Southland and Counties Manukau before defeating North Harbour 52–7 in a Ranfurly Shield Challenge. They set a record for the biggest win from a challenger on the road. However, they lost the Ranfurly Shield a week later to Canterbury 20–33. They reached the quarter finals, where they lost to Hawkes Bay 35–38 at McLean Park. 2008 saw the Mooloo men start slow with three losses and one draw. However, they defeated Auckland 34–13 at Waikato Stadium and wins over Counties Manukau, Otago and Taranaki saw the Mooloo men reach the quarter finals, where they once again lost to Hawkes Bay. Waikato began the 2009 like their previous season before defeating Counties Manukau, Hawkes Bay, Wellington, Taranaki, North Harbour, Otago and Northland to finish 6th. In 2010 Waikato had notable wins over Auckland and Canterbury to reach the semi-finals where they won a nail-biting 38–37 victory over Auckland at Eden Park to reach the ITM Cup final for the first time since 2006. Canterbury eventually won 33–13. Waikato were place in the Premiership for 2011 and won seven of their ten games including wins over Canterbury (Christchurch) Wellington (Waikato Stadium) and Auckland (Waikato Stadium). Their only blight was losing to Bay of Plenty 8–36 in Rotorua and to Manawatu 20–54 in Palmerston North. They reach the ITM Cup final, but lost to Canterbury 3–12 at Waikato Stadium. Waikato started the 2012 ITM Cup with two wins from six matches. However, they would win their last four matches, including retaining the Ranfurly Shield for the first time since 2007 with a 46–10 win over Taranaki at Yarrows Stadium. They later defended the Ranfurly Shield in their final game of the season against Hawkes Bay 28–3. This relegated Hawkes Bay to the Championship. Waikato finished fifth. In 2013 Waikato played two Ranfurly Shield matches in Morrinsville and Ruatoria against Heartland Opposition. They defeated both Horowhenua Kapiti and East Coast before the 2013 ITM Cup season. Waikato started their Ranfurly Shield campaign with a 31–22 win over Northland. However, the following week they lost the shield to Otago 19–26. They had an impressive 42–24 win over Auckland at Waikato Stadium. They would also challenge for the shield once again in 2013 against Counties Manukau at Pukekohe. Waikato lost 25–37 to Counties Manukau. This was their first lost to Counties Manukau since 2000. Waikato would defeat Bay of Plenty and Taranaki to survive relegation and finish 5th like the previous season. In 1930 Waikato provided 14 of the 15 players of the combination team that played Great Britain at Rugby Park. The visitors won the match 40 to 16 in front of 13,000 people. In 1937 South Africa toured New Zealand. Five Waikato players were involved in the combined side which lost 6–3 in front of a record crowd of more than 17,000. Waikato was the first provincial Union to beat a touring South African team post World War II, defeating the Springboks 14 points to 10 in 1956. Waikato defeating another large rugby nation, with a 22 – 3 victory over France in 1961. During the 1970s Waikato defeated numerous international sides; including a two-point victory, 26 to 24, over Australia, a 13 to 7 win over Fiji and defeating France for the second time, 18 to 15. Also during the 1980s, Waikato achieved a number of notable international victories, defeating Wales, Canada and Argentina in the latter years of the decade. Waikato also completed a number of international victories during the 1990s, with wins over Canada, Australia, Western Samoa, Scotland and Italy. Waikato have also attained the scalp of the British Lions in 1993. Prior to 1928, black and white and blue and black colours had been used. However, since 1928 they have worn the very distinctive red, yellow and black hooped jersey, with white shorts. These colours being a combination of the Hamilton (yellow and black), with Old Boys (red and black). Unlike many professional sporting teams in the modern era, Waikato have always retained the traditional design of the jersey. The main jersey/apparel sponsors are Waikato Draught, Lonestar, Gallagher and Kukri. As of 2009, apparel was being supplied by sporting firm Kukri. The Waikato supporters are known for their use of cowbells at home matches. This tradition has been carried over to home matches of the Chiefs during Super Rugby home games. The Waikato mascot is a cow called Mooloo, and the supporters are known as Mooloo Men. By extension, the term now applies to anyone from the Waikato area. The Mooloo Men also have one very special supporter who attends every home game, this man is widely known as Possum. He is situated up the top of a cherry picker which looks over the entire stadium and can be seen from any angle around the ground. Every few seconds he revs his chainsaw to show his passion and love for the Waikato rugby team. This is also a ploy in which to distract opposition players. Waikato Stadium during a British and Irish Lions match in 2005. Waikato play their home games at Waikato Stadium in Hamilton, built on the site of the club's former ground, Rugby Park. Construction began on the stadium in 2000; it was completed in 2001, and opened with a game between the Chiefs and Crusaders in the then Super 12. The Chiefs also play the majority of their home games at the stadium. Waikato played out of Rugby Park from 1925 to 2000. For the 1921 to 1924 seasons, Waikato played at the Claudelands Showgrounds and Steele Park. Waikato's first ever home match was played at the Claudelands Showgrounds against New South Wales, which Waikato lost 11 to 28. The Rugby Park grandstand roof collapsed in 1934, but no one was injured. Waikato Stadium hosted the first ever Air New Zealand Cup final, where Waikato defeated Wellington to claim the title. When the NZRFU were initially deciding the team compositions for the Super 12 in 1995, it was decided that to have the Blues franchise encompass the North Harbour, Counties-Manukau, Northland and Auckland provincial rugby unions to be unfair. This was due to the preponderance of All Blacks (players representing New Zealand) who came from North Harbour, Counties-Manukau and Auckland at the time. Hence if the Blues were to consist of these unions, they would field an All Blacks team in all but name. This led to North Harbour and Northland being represented by the nearest other team, the Chiefs (at the time named the Waikato Chiefs), also composed of Waikato, Bay of Plenty, and King Country. In 1999 the Chiefs ("Waikato" having been dropped from the title) boundaries were redrawn, with Northland and North Harbour moving to the Blues, and Counties-Manukau and Thames Valley coming under the Chiefs franchise. This represents the current Chiefs franchise unions. 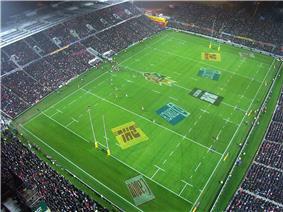 The Chiefs share a home base and main stadium with Waikato, being Hamilton and Waikato Stadium respectively. Waikato has a proud history in Women's rugby, providing many players for the Black Ferns over the years. The player's that follow are notable players of women's rugby. On 16 July 2016, the Waikato squad for the 2015 ITM Cup was named. Brian Alainu'uese and Luke Katene were not considered due to injury. Denotes team captain, Denotes that a player is unavailable due to injury, Bold denotes player is internationally capped. ^ Hooper, W. (1996). The Might of Mooloo. The Waikato Rugby Union. ^ "Mooloo 2006". mooloo.co.nz. Retrieved 22 October 2006. ^ "Timeline". mooloo.co.nz. Retrieved 22 October 2006.